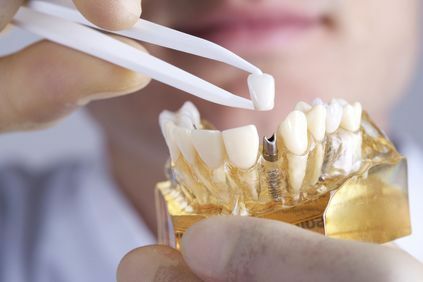 For patients looking to restore missing, damaged, or decayed teeth, dentistry services such as dental crowns and bridges, implant restoration, and inlays and onlays can restore function and aesthetics. Dr. Lurie provides a wide range of restorative dentistry services at his East Brunswick, NJ, dental practice to strengthen patients' oral health. Schedule an appointment today to learn more about the options available for restoring a smile. A dental crown (cap) is a restoration that is placed on teeth that have lost a lot of their structure, are misshapen or malformed, or have been root canaled. There are several types of crowns and Dr. Lurie will explain the advantage and disadvantage of each kind for you and your needs. In some instances an all-porcelain crown can be fabricated in one visit, while you wait, with no need for impressions, temporaries, or a second visit to cement them. This is using CEREC® technology. If the crown needs to be constructed the traditional way, the process of making a crown includes many steps that start in our office with preparing the teeth and taking impressions of the tooth/teeth involved. Then a temporary crown is placed on your tooth until the crown is able to be fabricated at the lab. At the lab the technicians will construct a crown that perfectly fits over the new shape of your tooth and when placed in your mouth, gives the appearance of a beautiful new tooth that matches and blends well with all your other surrounding natural teeth. Are you missing a tooth? A similar process used to create a single crown can be utilized to replace a missing tooth. By preparing the two teeth adjacent to the missing tooth, a bridge can be made by using these two "anchor teeth" as supports to hold a replacement tooth in the middle of them. Missing teeth can create a host of problems both aesthetic and functional, but bridges can be an option used to restore health and beauty to your smile. Bridges can prevent teeth from moving and improve the appearance of your smile. Dr. Lurie will be able to evaluate each case and determine candidacy for dental implants. 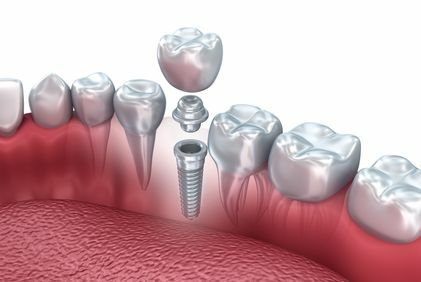 Basically, a dental implant is a titanium based cylinder that replaces the missing tooth root. After a period of time, and when the bone around the implant has healed, other parts will be placed on the implant that enables the doctor to eventually place a crown (cap) on the implant. Most patients with enough bone can have implants, although Dr. Lurie will always make recommendations specific to the patient. Usually an x-ray and a CT-scan is done to determine if there is enough bone to place the implant and also to determine the size and kind of implant that should be placed. Loss of natural teeth due to lack of bone support does not always mean that implants are not a possibility. Inlays and onlays are either lab or office fabricated restorations that are placed on teeth when the cavity or lost tooth structure is too large to be replaced by a filling, but not big enough that the full coverage of a crown would be needed. The process of making an inlay or onlay is very similar to a crown. After the tooth is prepared, an impression is taken and sent to the lab. From there, the restoration is fabricated and sent back to the dentist to try in and permanently cement. In many instances, porcelain inlays and onlays can be constructed in a single visit, with no need for impressions, temporaries, or a second visit to cement them. This is using CEREC technology. Dr. Lurie can explain to patients when an inlay or onlay is a good treatment option. In general, inlays and onlays can replace most of back teeth fillings and provide a better alternative to conventional fillings. At the same time they are more conservative than crowns. Dr. Lurie's welcoming environment helps put his patients at ease, while they receive the dental care they need. Reach out today to take advantage of our restorative dentistry services.